The HLG-Series are the latest generation of waterproof, high performance, LED power supplies. The "A" type, with adjustable current, can be used to provide power in many thermoelectric applications such as cooling/warming outdoor enclosures. 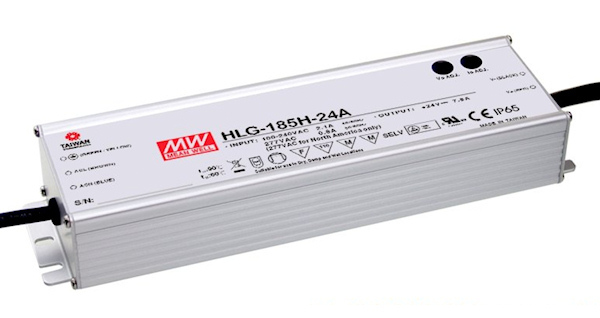 The HLG-185H-C (200W) series are for moderate power LED lighting applications with high output voltage demands. With active PFC, a wide input range of 90~305VAC and 350~1400mA rated constant current output for general lighting fixtures, HLG-185H-C also has high voltage output up to 400VDC. This is compatible with 277 Volt circuits for lighting in industrial and commercial 277/480-volt systems in North America. These are tough, environmentally protected power supplies. They are fully potted with heat-dissipating glue, in a rigid aluminum case that's sealed with stainless screws. HLG-185H-C has IP 65/67 ratings (depending on model) and can withstand vibration and forces up to 5Gs. They have a 4kV surge immunity level. Simply put, these power supplies can operate dependably in harsh environments with moisture and/or dust, indoors or fully exposed to the elements. HLG-185H-C was designed with the latest high performance topology and is up to 94% efficient. Needing to shed only 12 Watts at full power, sufficient cooling is accomplished by natural (free air) convection. They are able to operate in ambient temperatures from -25 ºC to +70 ºC (-13 °F ~ +158 °F). The HLG-185H-C series is also available in other output voltages including 20 Volt, 30 Volt, 42 Volt and 54 Volt versions. Contact us for price and lead-time for these. The basic or “Blank Type” is IP67 rated and has all the basic features without an ability to make voltage or current adjustments. D type (optional model) are also IP67 rated and a somewhat custom with a “multiple stage timer dimming” function that can be factory calibrated upon request (There are minimum quantity requirements). Additional features include protection from short circuits, over voltage, and over temperature. The HLG-185H-C series have global certificates for UL / CUL / ENEC / CB / CE and comply with UL8750, ENEC EN61347-2-13, EN62384 lighting regulations. Suitable applications include LED street lighting designed with single series connected LED strip and high driving voltage, LED tunnel lighting, LED spot lighting, LED high bay lighting, and indoor or outdoor LED decorative lighting…etc. "A Type" HLG-185H supplies can be used as the power supply for many thermoelectric applications.